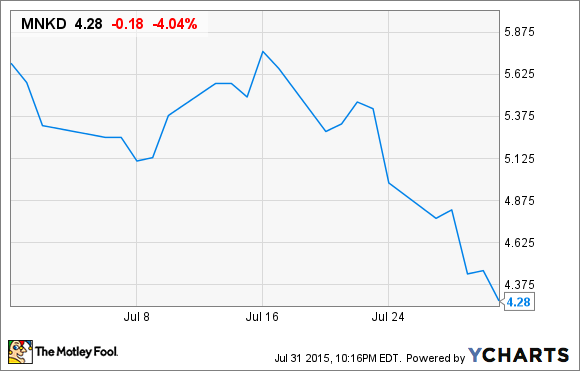 MannKind stock took a giant leap downward in July. Can this ship be righted, or has it already taken on too much water? Shares of MannKind (NASDAQ:56400P706), a biopharmaceutical company focused on developing medicines to treat diabetes, plunged 25% in July based on data from S&P Capital IQ following the release of disappointing sales results for its only approved drug Afrezza from MannKind's licensing partner Sanofi and the announcement of a debt exchange. The big downside catalyst in July was Sanofi's earnings release, which showed that Afrezza generated just 2 million euros, or $2.2 million in sales in Q2, and a meager 3 million euros, or $3.3 million, through the first half of 2015. Keep in mind that Q2 was Afrezza's first full quarter on pharmacy shelves. For an inhaled diabetes therapy that was hailed as having peak annual sales potential of $2 billion, the initial data would suggest that these figures might be wishful thinking. Why have Afrezza's sales been so poor? Thus far it's a mixture of minimal insurer coverage of the drug, which should improve over time, and a substantial number of primary care physicians still either unaware that Afrezza even exists or unwilling to take the extra steps involved in prescribing it over traditional insulin. MannKind and Sanofi are expected to really ramp up their marketing efforts in the second half of the year to improve the education aspect of Afrezza. On top of Afrezza's meager sales, MannKind also announced its plans to issue up to $56.9 million worth of shares of common stock in order to help pay off its 2015 notes, which are coming due very soon. It also announced that it would issue new convertible debt due in 2018 to raise $27.7 million. All told, the issuances should help raise $84.6 million, but it also demonstrates that MannKind's cash situation is far from healthy. The question investors have to ask here is whether or not MannKind can turn things around. Personally, I'm just not in the optimists' camp on this one. Even if MannKind and its licensing partner can right the ship, so to speak, and improve coverage of Afrezza while also bolstering education among physicians regarding the drug, we have to keep in mind that MannKind is only going to see 37.5% of sales at best. With it likely taking many years to reach its peak sales potential, MannKind could be bleeding money for the next three years, five years, or even longer. It's also a matter of valuation. Most biotech buyouts have recently been occurring around three times the peak annual sales of a lead drug. If Afrezza somehow managed to hit $2 billion in peak sales (generally the high-end estimate on the Street), MannKind is only set to receive $750 million in revenue (note I'm not counting its possible milestone payments from Sanofi). This $750 million would aggressively value MannKind around $2 billion. That's not much more than MannKind's current valuation. In other words, investors seem to be factoring in Afrezza hitting annual sales of $1.5 billion-$1.7 billion when the drug has thus far turned in only $3.3 million in four months and change. Overall, this situation isn't very encouraging, and I would strongly suggest investors steer clear of MannKind until it offers a clear positive catalyst and outlook.